KVS admission 2019 First Merit List Results. 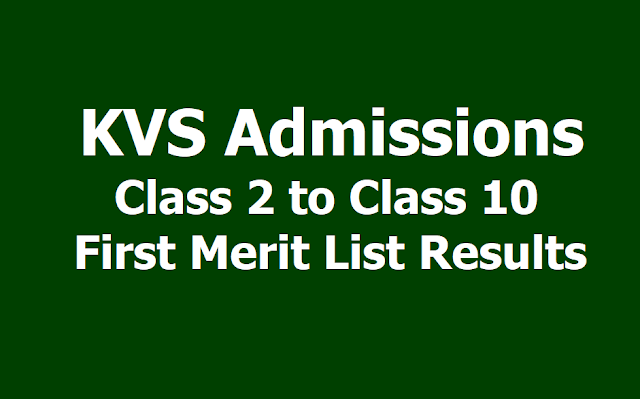 KVS admissions 2019 Class 2 to 10 First Merit List Results at kvsonlineadmission.in: The Kendriya Vidyalaya Sangathan (KVS) will release the first list of provisionally selected candidates for admission to class 2 to Class 10 on April 12. The list will be declared at the official website, https://kvsangathan.nic.in/ or kvsadmissiononline.in. Subsequently, the second and third list will be published. The lists will be released based on the availability of seats, no additional lists will be released if all applicants join the institute. The Kendriya Vidyalaya (KV) admission process 2019 for class 2 has begun from April 12, 2019. The selection list has been released as per the vacancies available for a specific class. The registration has been closed on April 9, 2019. The admission for class 11 will begin once the class 10 CBSE result is announced. The admission for class 2 (except class 11) will continue till April 30, 2019. During this period, selected students can complete the KV admission process as per the guidelines by Kendriya Vidyalaya Sangathan. 1. The admission to KV schools takes places as per the priority category basis. As per the guidelines, the category 1, 2, 3, 4, 5 are for central government employees, employees of autonomous bodies under the central government, state government employees, employees of autonomous bodies under the state government, and self-employed/ private job / floating population respectively. 2. The method for Class 2-8, class 9 and class 11 are different. The admission to class 2-8 is done on the basis of priority category basis. In case, the number of applicants is more than the total available seats, then lottery system runs for each category. For class 9, the admission test will be held. The merit list will be released as per the category priority basis only. The admission to class 11 will be based on the availability of seats and the class 10 result. 3. Candidates availing KV admission must-have a list of required documents. These are a valid birth certificate, proof of relationship in case the parent or grandparent member of Parliament or PSU employee, caste category certificate, PWD certificate, service/transfer certificate (if applicable), certificate of retirement (uniformed defense employees), address proof. 4. In the case of category 1-4, the validity of certificates will be verified by the Principal. Incomplete or incorrect forms will be duly rejected. However, in case seats left vacant principal may allow completing the pending forms. Any notification regarding this will be uploaded in May and June. 5. KVS offers admission as per the reservation criteria under RTE Act 2009. Out of total seats, 15 per cent and 7.5 per cent is reserved for Scheduled Caste (SC), and Schedule Tribe (ST) respectively. For the Person with Disability, a total of 3 per cent of seats are reserved. Kendriya Vidyalaya Sangathan has released the first merit list for class 2 to class 11. The admission process in these classes begins on April 12. Parents can apply for their child’s admission after finding his/her name listed in the merit list. The admission process for these classes will be through offline mode. Parents or students can check the merit list from the school they have applied for. Only Class 1 admission process is conducted through online mode in Kendriya Vidyalaya. Provisional List for KVS Class 1 selection was released on March 26, 2019. The second list was released on April 9, 2019. In case seats are vacant after the release of second list then third and last list will be released on April 23, 2019. The last date for admission in Class 2 or higher is April 20, 2019. Parents or students must note that all admission related formalities should be completed till April 30, 2019. The admission process for Class 11 will commence 10 days after the release of Class 10th board result. The registration process for these classes was started on April 2, 2019 and ended on April 9, 2019. The online registration process for admission to Class 2 to Class 10 in Kendriya Vidyalaya schools for the session 2019-2020 has begun since April 2, 2019 and to be closed on April 9, 2019. The registration for class 11 will begin within 10 days after declaration of 10th Class results. For class 11, application forms will be issued in offline mode after CBSE class 10 result is declared. This year, the CBSE has announced to declare the class 10 result early. Reportedly, it can be declared around May 10, 2019.The admission will start within 10 days after the KVS declares the shortlisted candidates’ list. The list can be seen on the official website of the individual schools. There is a total of 1,137 Kendriya Vidalayas across the country. The students will be shortlisted as per the priority category. - First List: The Kendriya Vidyalaya Sangathan (KVS) to release the first list of provisionally selected candidates for admission to Class 2 to Class 10 on April 12, 2019. - Second List: After the first list, the second and third list will be published soon respectively. KV Sangathan is a system of central government schools in India. KVs is amongst the largest chain of schools in the world. Nearly 1200 Kendriya Vidyalayas are available in the country. This system came into existence in the year 1963 under the name 'Central Schools' which was later changed to Kendriya Vidyalaya. All schools under it are affiliated to Central Board of secondary Education. Under the Right to Education (RTE) Act, 2019, 25 per cent seats are reserved for children who belong to economically weaker section and socially backward families under the Right to education or RTE Act, 2009. Candidates may check the official website, kvsangathan.nic.in for further information.